Vittoriosa mayor John Boxall and his council are facing a dilemma over whether the historic clock tower in the town's main square should be rebuilt or not. The foundations of the 16th century tower were discovered following excavations but residents remain divided over what should be done. Mr Boxall has suggested the possibility of a referendum on whether to rebuild the tower. However, a number of residents feel that since the council was elected democratically, it should decide on the issue. Mr Boxall said that now that the foundations of the tower have been unearthed, small archaeologists' tools have taken over from heavy equipment to dig the square, to unearth the base without damaging it. Any decision about the future of the tower would be taken in liaison with the Cottonera Rehabilitation Committee. 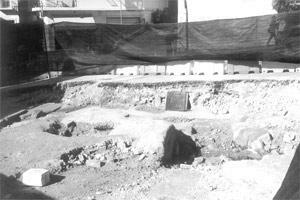 The two entities had undertaken the task of locating the foundations and started digging the square earlier this month. The clock tower, which was an important landmark in Victory Square, was demolished during enemy action in World War II. Resources and Infrastructure Minister Ninu Zammit said when he had visited the start of works that an evaluation would be made of whether it was technically possible to rebuild the tower. Some residents argue that the tower - which used to stand in the main square - is part of the town's heritage and should therefore be reconstructed. Others feel there is no real need for it. Apart from taking up already scarce parking room, the structure would not be the same as the old one. Most of the clock's mechanism is stored at the local council premises and one of the clock's hands is exhibited at the Vittoriosa Museum.